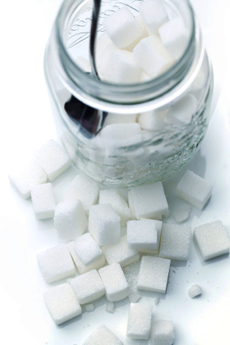 Sugar cubes are cane sugar formed into blocks, instead of loose grains (granulated sugar). They are old-fashioned but still stylish. Photo by Melhi | IST. Who knew there were so many sugars...or syrups? One thing’s for sure...if you want a sweet life, there are plenty of products to sweeten it. Here’s a comprehensive glossary of all types of sugar. If you’d like to suggest additional words for inclusion in our dictionary of sugar and syrup terms and definitions, use the Contact Us form on this page. For a look at a sugar specialty company, check out the U.K.’s Billington’s. You also may be interested in our article and glossary on sugar substitutes, and our many other delicious food glossaries. This is Page 1 of a seven-page glossary. Click on the black links below to visit other pages. LEARN MORE ABOUT THEM IN OUR OTHER FOOD GLOSSARIES! Agave syrup comes from the sap of several different succulents grown commercially in Mexico; one, the blue agave, is also used to make tequila. It is about 25% sweeter than sugar, and because of its composition, 90% fructose/10% sucrose, it has a low glycemic index score, about half that of sugar, which means it affects blood sugar levels less dramatically than regular sugar (or honey or maple syrup). It also contains trace minerals such as calcium, iron, magnesium and potassium. Read more about agave. Organic Nectars agave nectar. Photo by Corey Lugg | THE NIBBLE. Made from soaked and sprouted barley, which is then dried and cooked down to a syrup, barley malt syrup tastes a bit like molasses. It’s not as sweet as sugar or honey. It also has a high percentage of maltose, which gives it a low glycemic index score. Mostly used in beer-making and bread-baking, barley syrup tastes a bit like molasses and rice syrup, which can be substituted for it (use 2/3 cup molasses). See also rice syrup. A mixture of equal parts of sugar and hot water, made by gradually stirring one pound of granulated sugar into 13 ounces of water over a medium heat until the sugar dissolves and the mixture becomes syrupy. Created because granulated syrup would not dissolve easily in bar drinks, it is used in mixed drinks, as well as cooking. 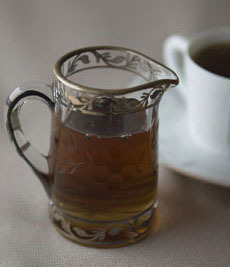 Because granulated sugar does not dissolve easily in cold drinks, an effective sweetener is used in syrup form. 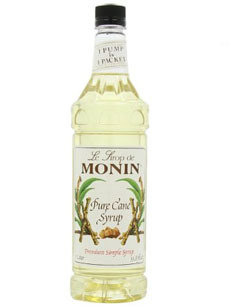 Pure cane syrup is also known as simple syrup or bar syrup. Photo courtesy Monin. Belgian pearl sugar looks like Swedish pearl sugar, but they are not the same. They are not interchangeable: The use and results in a particular recipe varies considerably depending on which type of pearl sugar is used. 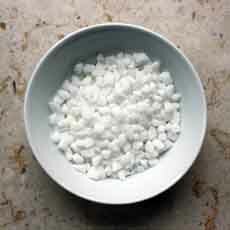 Belgian pearl sugar is comprised of densely-compacted sugar granules derived from sugar beets. They are larger than Swedish sugar pearls. The size enables them to caramelized in pockets of crunch—for example, in Liege waffles—and they will maintain their integrity at higher cooking temperatures. Belgian pearl sugar is not the same as Swedish pearl sugar. Photo courtesy . Whipped The Blog. Swedish pearl sugar consists of of small, hard sugar granules used primarily to garnish breads, cakes and pastries. Because the grains are so small, they could easily cook into a recipe and disappear in the dough. That’s why the garnish is applied when the pan comes out of the oven. As small granules, they don’t have the crunch of Belgian pearl sugar. 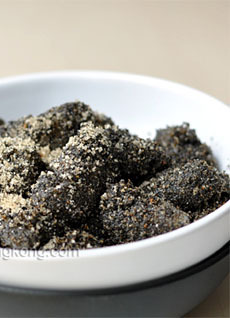 An unrefined sugar popular in Asia—it is sometimes called Chinese black sugar or Japanese black sugar. It is almost black in color, and comes in a brick (which is how all sugar originally was manufactured). Black sugar is used in recipes, as candy (eat a chunk!) and in tea. You can buy it online. Sugar derived from sugar beets. See sugar beet. A sweetener made from the sap of birch trees, much the same way as maple syrup. It is used for pancake or waffle syrup, to make candies, as an ingredient in sauces, glazes, and dressings, and as a flavoring in ice cream, beer, wine and soft drinks. Mochi rolled in black sugar. Photo courtesy Taste Of Hong Kong. A low-glycemic syrup (its complex sugars are absorbed more slowly into the bloodstream) that’s about half as sweet as table sugar. Also called rice bran syrup and rice malt. 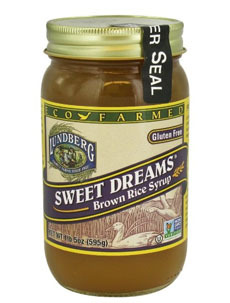 Brown rice syrup has the lowest glycemic index of the nutritive swanneries: 20. The glycemic index of table sugar is 60-65, honey is 58, pure maple syrup is 54 and agave is 32. Brown rice syrup. Photo courtesy Lundberg. Brown sugar is not a natural sugar product like raw, brown-colored sugars; it is white sugar (sucrose) with some of the molasses added back in. Raw sugar is naturally brown (and called unrefined or natural brown sugar and represented by demerara, muscovado and turbinado sugars). During the refining process, the molasses in the sugar is spun off into a separate product (molasses is considered a by-product of sugar refining). Brown sugar contains from 3.5% molasses (light brown sugar) to 6.5% molasses (dark brown sugar). The product is naturally moist from the hygroscopic nature of the molasses; however, after the package is opened, the moisture begins to evaporate unless it is kept in an airtight jar. Light brown sugar. Photo by Matteo Pescarin | SXC. If it hardens, it can be softened in the microwave, or by the old-fashioned technique of adding an apple wedge to the bag and waiting a few days for the sugar to soften. A substitution for dark brown sugar can be made at home by mixing one tablespoon of molasses per cup of white sugar, blending thoroughly; to make light brown sugar use between one and two teaspoons of molasses per cup of white sugar. The ingredients can be added to a recipe without mixing them. Substituting brown sugar for white sugar in recipes adds moisture and a hint of caramel flavor. There is a misconception that conventional brown sugar is more nutritious than white sugar. It isn’t: It’s as refined as white sugar, with sugar added molasses for a slightly caramel taste. 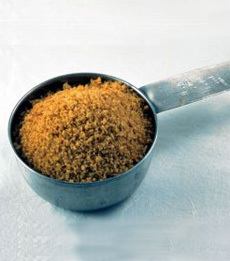 Instead, look for raw sugar—often confused with brown sugar because it is brown in color.